I bought a ring from you at the Not Yo Momma's Craft Fair in Jersey City a few weeks ago and just wanted to let you know how much I'm enjoying it. It's so lovely and I've gotten some nice compliments on it. Looking forward to seeing you at shows in the future! I love the Rustic Sunset Barrette! I included a little blurb about it on my blog! Not only did my sister go gaga over the earrings, but she's passing the website onto her friends who I'm sure will be buying your stuff pronto! At the holiday party they were all asking about her earrings! I've worn the necklace almost every day since I received it. I love it and have gotten so many compliments on it! I love, love, love my ring from Baublettes! I get compliments on it all the time! The website is actually fun to use and I received my order so quickly. Great customer service and a great product! I bought a pair of earrings from your company for my girlfriend. They were the brown lucite ones with gold parts. She was putting together a birthday outfit and couldn't find the right earrings to match a psychedelic belt, but was delighted when she opened the box. She really dug the hoops and how they could go with purple, black, or brown. Thanks, Baublettes! 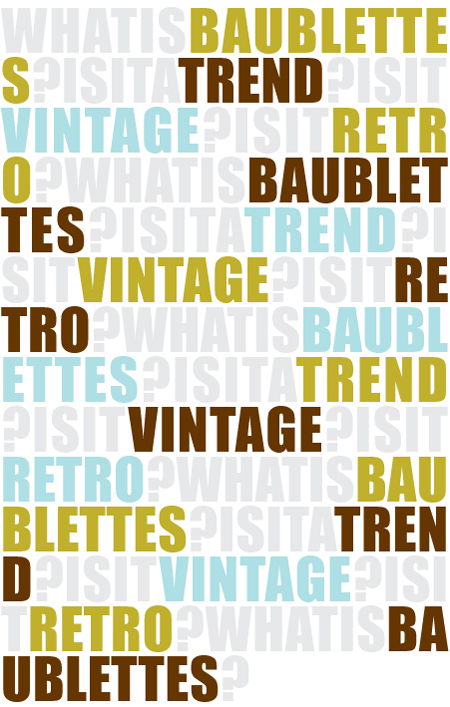 If you have something you would like to share with us, please email us at beth@baublettes.com.